64% of customers say this fits as expected. Been doing crossfit for the last 7 months in my Brooks running shoes and didn't think anything of it. Love them, perfect fit, super stable and comfortable. 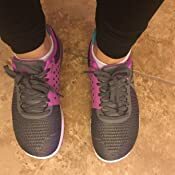 I do crossfit and used to wear a Nike Metcon which I was very happy with. Anatomical toe box and a low-cut design for a natural feel and ankle mobility. 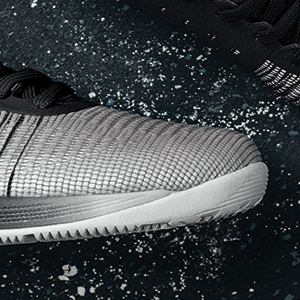 360-degree TPU heel wrap for a locked-in feel. Removable insole.The added heel piece creates a fit lockdown for better leverage as you lift. Bear KompleX 2 Hole Leather Hand Grips for Gymnastics & Crossfit, Pull-ups, Weight Lifting. WODs w, Wrist Straps. Comfort & Support- Hand Protection from Rips & Blisters. Seamless upper construction provides durable ventilation. Evolved woven technology provides a comfortable and secure fit. 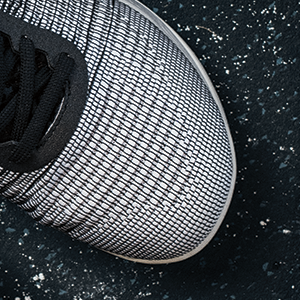 Minimal-drop outsole provides a solid foundation for lifting. 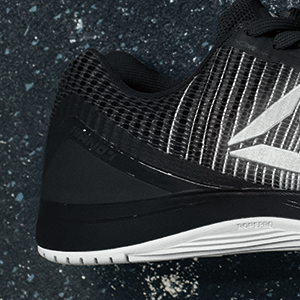 Change the game on CrossFit with the new Reebok Nano 7. The multi-surface outsole takes on rope climbs and burpees with ease. The external heel counter creates a stable feel for lifting. Updated Nano tooling and nanoweave upper speak true CrossFit style. 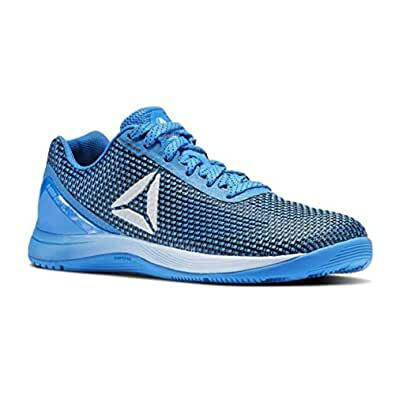 I do Crossfit every day, and I wear "American" size 7 and own other size 7 Reebok shoes, but this shoe would not fit my foot at all. This size 7 was more like a size 6, and it is super hard, narrow and had I ordered a size 8, would likely take many weeks to break in. 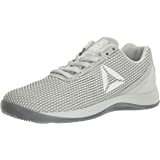 I read other reviews that said this shoe would benefit heavy lifters, which I am not, but I never imagined how uncomfortable this shoe would be. 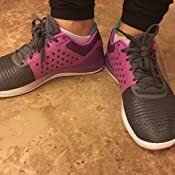 It has a beautiful design and color, which is why I ordered these, but I will never order athletic shoes online again until I have tried them on in a store first. Overall, I like the shoe. 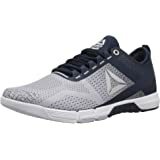 But just a warning: if you have previously worn the Nano 4.0 or 5.0, these are going to feel much heavier (sole feels great for lifting but very rigid and heavy for running, box jumps etc.). The toe box is also going to feel very narrow. The size fits correctly (I always buy 7.5 that was not an issue) but these are made much more narrow compared to other Nanos. After a few workouts I am starting to get used to them and I do like them. Just felt it was worth sharing how different they are compared to previous Nanos. 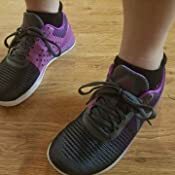 I use these shoes to perform only HIIT exercises and weights. They are flat and are stable when you balance and when you perform jumps. They are sturdy enough to do floor running exercises. However, I do have to say that if you get your size, expect your toes to be at the very tip of the shoe. If you want a little more toe room, I'd say get half a size larger. They also came very hard, so they cramp up my toes within an hour usage. For this reason I am giving these shoes only 3 stars. Also, if you notice in the pictures, the side of the shoe is already warped within 3 days of use only. I am wondering if I'm going to have to replace these shoes very soon because of this. I do not recommend these shoes for running. 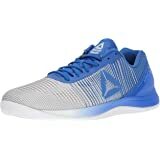 4.0 out of 5 starsGreat shoe for squats! I bought these based on my personal trainer's recommendation. I was using my running shoes (I know, right?!) for squats and weight training. I definitely noticed a HUGE difference right away. These keep me anchored and help with my form. The only reason I gave them 4 stars is that I used them for my HIIT class and they rubbed my ankle a little. I think socks a little higher would help, but I like the no shows. I did notice, however, they are good for plyometrics. 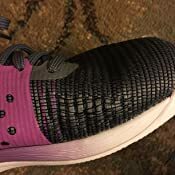 I normally wear a size 10 and thats what I ordered first and then had to send back for a size 11 as they are very snug around the top of the foot. 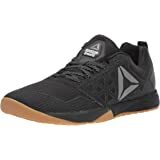 Ive been paying Crossfit for just over a year now and finally decided that shoes were my next purchase. They are great for squats and deadlifting and all the other fun things in between that we at crossfit do. Honestly, now that I have them though, I find that I like doing as much as I can barefoot as possible as I just find it more comfortable and grounding. 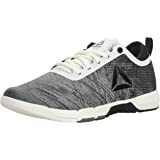 I do think that these did help with my form though and if you plan to stay with crossfit then Id get them- you will need a good shoe if you want to continue on your health journey! Been doing crossfit for the last 7 months in my Brooks running shoes and didn't think anything of it. 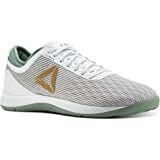 Decided to spoil myself for sticking with crossfit for so long and got these after trying them on at the local sporting place and not liking the colors. Holy cow these have changed my crossfit life. I totally notice the difference and I PRed three new lifts in the last week alone. I haven't noticed any pain with the shoes besides general breaking in. Loving them so much I might need to buy them in a couple other colors! 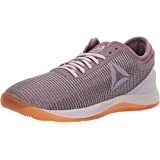 This is my first rebook crossfit shoe. It s very comfortable and strong. 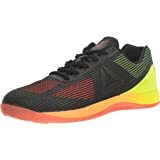 I do crossfit and used to wear a Nike Metcon which I was very happy with. My husband gave me this rebook for my birthday and I feel it is stronger and give me more stability than the Nike. I recommend this shoe. And particularly this one has beautiful colors. And it s true to size.